The Sony NEX-6 is a compact and powerful ILC, featuring an APS-C sized 16-Megapixel CMOS image sensor, BIONZ image processor and more features and performance than you will find on a consumer dSLR. Combine that with the excellent image quality, a great selection of E-mount lenses and an ever-growing list of new apps, this camera will always have what you are looking for. Read more in our Full Conclusion. Sony's popular Next Generation, or NEX, series already includes the flagship NEX-7 and the WiFi-capable NEX-5. Instead of replacing either model, Sony engineers decided to split the difference and create a new camera, the NEX-6, which features the best technology from both cameras. 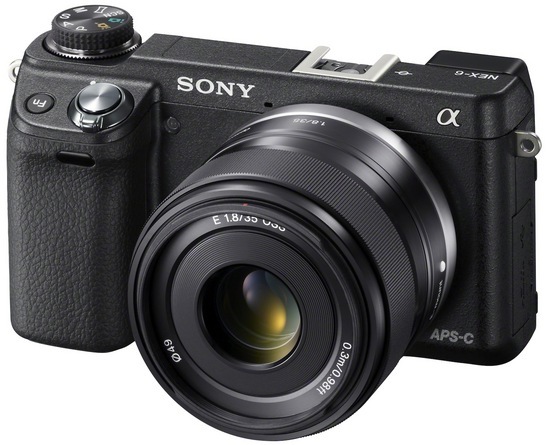 The Sony NEX-6 features an APS-C-sized 16.1-megapixel CMOS image sensor coupled with the BIONZ image processor. For glass, the camera will work with any E-mount lenses, but will be available with a 16-50mm kit lens capable of utilizing Sony's Fast Hybrid AF (Auto Focus) system, a 99 phase detection AF points arrayed on the image sensor (does not work on ALL E-mount lenses, pending a future firmware upgrade). There's also a 3.0-inch Xtra Fine LCD display, a 2.6 million dot, full frame, Electronic "Tru-Finder" EVF, full 1080p HD video recording, professional DSLR-inspired P/A/S/M shooting modes, and Sweep Panorama Mode. The NEX-6's biggest selling point maybe its WiFi capabilities, which are not found in most entry-level DSLRS with the same size image sensor. Sony's PlayMemories Camera Apps allow users to customize their cameras, transfer photos to iOS and Android devices, or even directly load pictures to Facebook. Combination card slot accepts SD and MS Duo type cards. The Sony NEX-6 is available in two kit forms; one with the 16-50mm (SELP1650) power zoom lens for around $1,000, and another with both the 16-50mm (SELP1650) power zoom and 55-210mm (SEL55210) telephoto zoom lenses for about $1200. A body-only version costs about $850. Click our Lowest Price button at the top right of this page to see the most current online pricing.